James R. Fuller was an executive for Volkswagen of America when he was aboard the ill fated Pan Am flight 103 that went down over Lockerbie due to a Libyan terrorist bomb. He was one of the biggest champions of bringing the bonkers Golf Rallye to our shores. With all the talk about aircraft lately I was reminded of this story. A little history, Fuller was an American, born in Boston, and a car fanatic from an early age. After stints at Ford, American Motors and Renault, he joined VWoA and was in charge of the Porsche-Audi division. After success in the early 80’s growing the Audi brand, he went to direct the VW brand. Instrumental in convincing the Germans that the GTI should be built and sold in America. Following the critical acclaim and sales numbers, the Jetta GLI was released soon thereafter.Although he had his doubts about the feasibility of the Westmoreland plant, he helped make sure the plant stay open to produce the new mkII Golf for some time. 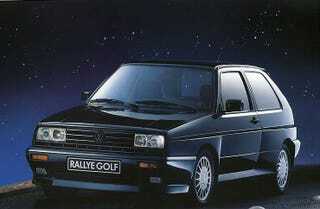 He also paved the way for the Corrado and Passat into the country, though those didn’t make it till after his death. So with all of this high performance achievement under his belt, and with the homologation G60 powered, flared-fender having, all wheel treading Golf Rallye under development, he decided it was time for VW to up it’s game in the States. Although Golf sales were in a slump, and VW management in Germany thought VW’s brand perception didn’t support a truly high performance, high dollar car over here, Fuller kept pushing for it. I think in retrospect it would have sold quite well for what it was. GTI’s and GLI’s certainly weren’t cheap cars and they did just fine. In December 1988 Fuller and VWoA Marketing Director Lou Marengo were coming home from a meeting in Germany when the plane went down, and VW corporate stuck to the decision to not bring the uber-Golf into the States. And that’s history folks. Now we have the R/R32 and those seem to be doing pretty ok too. But this was the original.